Altenheim’s Therapy Rehab Center has expanded to offer aquatic therapy to their patients to safely accelerate rehabilitation with less pain for individuals with a myriad of ailments. HydroWorx products are used by top healthcare and sports facilities worldwide. The HydroWorx will be offered for both inpatient and outpatient therapy clients. Altenheim is proud to be one of the few facilities in the Northeast Ohio area to offer this state of the art equipment. Aquatic therapy has been used by its customers to allow patients to get quicker results while increasing strength and flexibility. The Hydroworx Unit will be located in the Altenheim Therapy Rehab Center 15653 Pearl Road Strongsville Ohio 44136 in the Outpatient Therapy department. 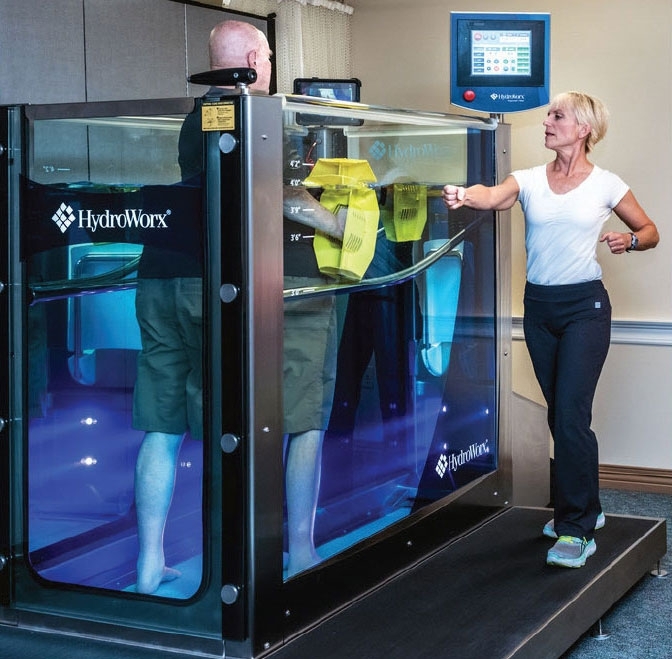 HydroWorx’s patented underwater treadmill is revolutionizing rehabilitation, conditioning, and recovery. HydroWorx explains that, the natural buoyancy of water eliminates from 20% to 90% of an individual’s body weight. For example, in collarbone-deep water, a 200 pound subject might bear only 20 pounds while in the aquatic therapy pool. This, in conjunction with therapeutic warm water, can allow for substantially decreased joint compression and pain. As a result, early range-of-motion gains through HydroWorx rehab can be realized. Gait training in a low impact environment allows for earlier replication of proper ambulatory biomechanics. Such training would otherwise be postponed until pain-free, land-based training is possible. Hydrostatic pressure promotes the healing and strengthening of injured tissue by reducing joint stiffness, decreasing swelling, and lowering blood pressure levels. Cardiovascular stamina, muscle toning, and flexibility are augmented by the resistance that water provides. HydroWorx specializes in designing, manufacturing, and marketing the world’s finest water therapy and conditioning equipment for the sports, health care, senior care, and fitness markets. The company leads the industry in scientific research and data supporting the therapeutic and rehabilitation properties of water therapy. HydroWorx has sold products in 50 states and twelve countries. Among its extensive and elite client list are renowned orthopedic surgeon, Dr. James Andrews; The Ohio State University; Cleveland Browns; Cleveland Indians; Bowling Green State University; University of Toledo; Cleveland Clinic; University of Toledo Hospital; Cincinnati Bengals, Ohio University; etc. To schedule an appointment call or visit us today at 440-238-0300.